Soyuz 11 was a manned space mission. It was the only mission to live on Salyut 1, the first space station. It was a backup mission of Soyuz 10, which was failed to dock. The mission killed three men in space. They were Georgy Dobrovolsky, Vladislav Volkov, and Viktor Patsayev. An X-ray testing of the original crew found that Kubasov might have tuberculosis. According to the mission rules, the backup crew replaced the original crew. Dobrovolski and Patsayev never flew to space before. 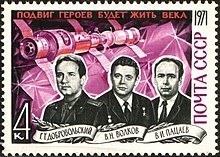 Kubasov and Leonov became the crew to Soyuz 19 for the Apollo-Soyuz in 1975. On 30 June 1971, after returing to the Earth of the capsule, the recovery team knocked on the side. There was no response. Opening the hatch, they found all three men in their couches, no motion. There had dark-blue patches on their faces and trails of blood from their noses and ears. They brought them out from the capsule. Dobrovolsky was still warm. According to their reports, the reason of death was suffocation. The cosmonauts were buried in the Kremlin Wall Necropolis at Red Square, Moscow near the remains of Yuri Gagarin. US astronaut Tom Stafford was one of the pallbearers. They were also each awarded the Hero of the Soviet Union medal. ↑ Ben Evans (24 April 2013). "The Crew That Never Came Home: The Misfortunes of Soyuz 11". Space Safety Magazine. Retrieved 7 March 2019. ↑ Time Magazine (12 July 1971). "Triumph and Tragedy of Soyuz 11". Time Magazine. Retrieved 7 March 2019. This page was last changed on 26 March 2019, at 16:31.